Tonight and Tomorrow: Warm and muggy conditions tonight, as temperatures will be slow to cool and staying in the 80s until shortly after midnight. Overnight lows will be around 76°. Clouds will be breaking slowly overhead, eventually leading to mostly clear skies by late evening. Winds will continue out of the south between 5 to 10 mph, helping to keep the input of Gulf moisture prevalent as we wrap up the weekend. Sunday will bring another hot and humid day for our area, as temperatures will ramp up around 93 with heat index values nearing 105 through the afternoon hours. There is a slight chance for a brief, cooling drizzle, but the chance is slim. Up Next: The heat and humidity will be elevated for the next several days, as strong high pressure sets up camp in the Gulf of Mexico. This will protect us from showers and storms associated with a frontal system to our north, but will also keep bringing Gulf moisture onshore via southerly winds. 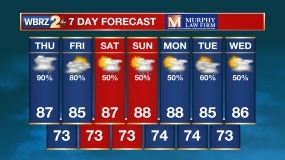 The high pressure will begin to degrade as we head into the workweek, bringing back afternoon showers and storms that will peak during the midweek as a frontal system moves in from the northwest. Strong high pressure in the Caribbean has slowly moved northwest along the west coast of Florida, and continues to strengthen westward and into the Gulf. This will keep a protective “bubble” across the Gulf Coast states, but that protection is only from storms and not from heat and humidity. Heat index values and dew points will stay elevated, as afternoon “feels like” temperatures will stay in the triple digits through the beginning part of the workweek. Conditions will stay muggy through the evening, as the moisture content in the air will help to keep low temperatures warm and humid. The high pressure eventually begins to degrade and retreat back to the east on Wednesday and Thursday, helping to bring an increase of afternoon showers and storms associated with a frontal system that will push into the Gulf. It will still be losing a lot of its strength, but still should hold on to enough of it to bring scattered showers and storms to the area. High pressure should begin to strengthen again in the Gulf as we approach the weekend, helping to dry things back out.